FSA Chairman, Lord Turner tells Andrew his organisation expected similar figures, in October 2008. Well the Financial Services Authority is the body. It was created by Labour Government just over a decade ago with responsibility for regulating the banks. Last year, the FSA was accused, as we've heard, of substantial and systemic failure over the collapse of Northern Rock; and last week, just half an hour before the Prime Minister faced the Commons, the FSA lost its number two, Sir James Crosby, after concern about his role in the devastated HBOS, which is now in danger of course of dragging down Lloyds. Well with me is the FSA Chairman, Lord Turner. Welcome and thank you for coming in. Let's start with the Sir James Crosby…Did you know when he was appointed how controversial parts of his term had been in HBOS? (over) Did the FSA know? …appointed. The appointment also is done by the Treasury, not by the FSA itself. I think the general point to make though - and I think this is very important - is we've got to separate in the affair of James' resignation, the specific accusations that he had fired somebody who was a whistle…for being a whistleblower, which was looked at carefully by a KPMG report and found not to be correct versus the more general point as to whether everybody should have seen back in 2004 that the whole way the financial system was developing in the UK and the US and throughout the world had very large systemic risk; the whole system in total was risky. And the answer is we didn't focus enough on that. The FSA and the Bank of England and the Treasury and the Fed and the OCC in the US did not focus enough on those issues and we've got to get that right for the future. It's a new philosophy that we'll have to have right for the future. I absolutely want to come onto that, but just before I leave Sir James Crosby, what interests me is that the FSA itself had looked at HBOS and on several occasions blown the whistle as it were and said there is a problem here about the potential recklessness inside HBOS, and yet the guy that was in charge then comes and becomes number two in the FSA. Well let me make something very clear. At any time there are FSA risk mitigation programmes saying there are things we're worried about about an institution, which cover every single institution, right? (over) So it wasn't just HBOS. It was every bank. (over) No, look, a risk mitigation programme will have fifty action points or so for you know a major institution, an insurance company or a bank, and I don't think there's been a single case - and I don't think there ever will be a single case - where we said there is no risk mitigation programme, you've got everything right. And therefore you cannot work on the assumption that you're going to look through institutions and say that the fact that there is some criticism of particular aspects of what they're doing suggests that they are completely unstable or the people who are running them are unacceptably risky. …there's not a single institution now, or ever will be, that doesn't have some category of risk mitigation programme there. Sure, but this isn't any old institution, is it? This is an institution which has just lost the taxpayer the equivalent of 2½ p in income tax - £8 billion ..
No, I think that's absolutely right. …thus far. It was fingered by the FSA specifically on several occasions, and the guy in charge of it then moves over to the FSA and has to resign. (over) No, the specific…the specific things that the FSA identified back in 2004 were things to do with the reporting lines in the risk area, the way that it was structured, and we suggested that they had to look at that. They took action which actually did put those reporting lines and the processes into a state that we were more happy with. What is completely legitimate to say is that the FSA at that time was more focused on the processes, the structures, the reporting lines rather than simply saying when I look at this whole business model and look at it within the context of the overall economy and the expansion of credit, it's all too risky. The approach was too focused on processes and procedures and things like that rather than the fundamental economics. That is a legitimate criticism and that's what we have to get right for the future. So we don't need to have an argument really about whether the FSA has failed in its job because it has failed, patently it's failed. …and there weren't many people who got it right at that time - that is a legitimate criticism. Well one criticism that was made at the time and has been repeated by Terry Burns, for instance, formerly in the Treasury, is that the FSA shouldn't really have been created in the first place; that the old system where you had the Treasury and the Bank of England was a better, faster system for dealing with crises, and that actually the ten years of the FSA's existence has overall been a huge policy mistake. I think what's interesting if you look around the world, where sometimes banking regulation is combined with central banking and sometimes it's separate, is that the degree of success in predicting and dealing with this financial crisis has been randomly related to the organisation structures that people have. …the regulator of the conduct of business, of mortgage brokers, of independent financial advisers. There's a whole sort of mass market bit of the FSA and you have to be, when you talk about the 2,500, 2,800 staff, you have to be aware of that. You're relatively new running the FSA, as you pointed out, but do you…would you say sorry on behalf of the FSA to all those people who've lost huge amounts of their savings and are very, very angry and very worried now? I'm talking about the FSA. …there was a failure to focus on these systemic risks. And it was an intellectual failure. If you actually look…Let me give you, let me give you an example. (over) Just before you do, can I just say you inserted "all around the world" there and I'm asking about the FSA. (over) No, no, no, but…Well, I think actually it's really not for me to answer that question, given that I was not there at the time. I mean it's a…The FSA was doing a lot of good work in many aspects, but it, like others, failed to focus on these wider systemic issues. And there are very, very deep issues about how we get it right for the future and also how we create adequate intellectual challenge for the future. I can take you back to two or three years ago where there are reports, including from the IMF, which are saying this world of securitised credit has reduced the risks in the financial system. It isn't just that we failed to see the risks. There are actually paeons of praise out there, written by important, intellectual bodies, saying that the risk in the financial system had reduced. That was the extent of the intellectual failure which occurred. Do you think that politicians and bankers have been too close? I'm thinking about the Lloyds/HBOS deal, for instance, which now appears to have been a catastrophic mistake. Do you think that politicians have been too in awe of bankers perhaps and too credulous about bankers? I think that over the last ten years there probably was too much of a fascination with what you could in general call finance capitalism and a failure to realise the risks that were emerging, and perhaps at the end of this there will be less fascination. I think bits of the financial services industry, in particular the bit that relates to structured credit, will get smaller, and I think actually that is what should occur. Do you think Gordon Brown should not have been so close to Sir James Crosby and Victor Blank? It's not for me to make comments on that. I am not a politician, I'm not involved in the political process. You should have asked Vince about that a few minutes ago. (laughs) Indeed. But well in general terms. Let's come back to the future. You're conducting a review of regulation. How different is the new world of regulation going to look? I think the new world of regulation will look really quite different. My review will be published on March 18th and it will set out very major changes, which we are already in the process of making or will make, to the capital which banks have to hold, particularly against the trading books, the risky trading activities; to the way that we regulate their liquidity; to how we make sure that there aren't what was sometimes called 'near banks' or 'shadow banks' that escape regulation. The key there is regulation by economic substance, not legal form. If it quacks like a bank and looks like a bank - it's a bank, we regulate it like a bank. Stuff on remuneration, on credit rating agencies, and a very strong reinforcement of our supervisory process, which does require more people. It doesn't require lots more people, but it does require more people; and, as Vince said earlier, some higher quality, some new skilled people. That's what it will entail. It will be a major change and we are in the process also of debating that with colleagues around the world about major changes which are going to be agreed internationally. Would you accept that the Lloyds/HBOS conjuncture was a disaster? …revealed this week, I would point out are not huge surprises to the FSA. Remember what we did last October was run stress tests which were considerably worse than what was then in the public domain in order to work out how big the capital subscription had to be. And the figures that came out - we're checking them, we're looking at them closely - are not order of magnitude different from what we thought was going to occur back in October. So you predicted this. Were you actually consulted before this merger took place? (over) Well let's, well let's be clear. (over) Would you have warned them? (over) You knew what was going to happen, or you suspected what was going to happen? …you have to make pragmatic decisions. Finally, this whole question of bonuses. As you know, there's huge public anger about it. Should they not simply cease for the time being across the banking sector but also in your own institution, which is going to pay bonuses at the moment? …told me on Friday that he personally does not want to take a bonus. That is the same approach which the Permanent Secretaries are using in the Government and I think that is the appropriate way forward. Lord Turner, Adair Turner, thank you very much indeed for joining us. We have just got one fragment of time left. 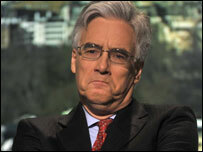 I can just turn one more time to Lord Turner and ask the Lloyds bonuses in specific terms - should they be cancelled? Yes or no? That is a matter for the Government as a shareholder and for the management of Lloyds. Our interest is that the structure of bonuses for the future - and I'm sure there will be bonuses in the banking system - does not encourage unnecessary and unreasonable risk taking. Lord Turner, thank you very much indeed.